peak levels during the Q4 holiday season. The holiday season is a critical period for advertisers. Fierce competition for consumer attention has caused digital ad spends to swell dramatically over the past several years. But, these big buys are attracting more than just consumers -- ad fraud levels reach their peaks during the holiday season. If unchecked, cybercriminals could net as much as $3.5 billion within the next three months. Considering the total ad fraud losses are estimated to be $6.5 billion for all of 2017, that means these cybercriminals will collect over 50% of their payout in Q4 alone. Since 2010, digital ad spend has grown by nearly 3x, reaching $73 billion in 2016. According to eMarketer, that number is expected to grow to a record-breaking $83 billion by the end of this year, surpassing TV spend for the first time. This shift to digital ads has occurred alongside the broader move to digital media and digital devices. Adults between the ages of 18-24 reportedly spent nearly 30% less time watching TV in 2016 than they did in 2012. Instead, that time is being spent on digital media. An average adult spent 5.6 hours per day with digital media in 2016 -- the highest amount ever. Many advertisers choose to spend a significant part of their budget in Q4 -- particularly in November and December. To put it in perspective, November and December of 2016 saw almost 50% more spend than the average of the other months. All told, advertisers are expected to spend an estimated $25 billion in Q4 of this year. 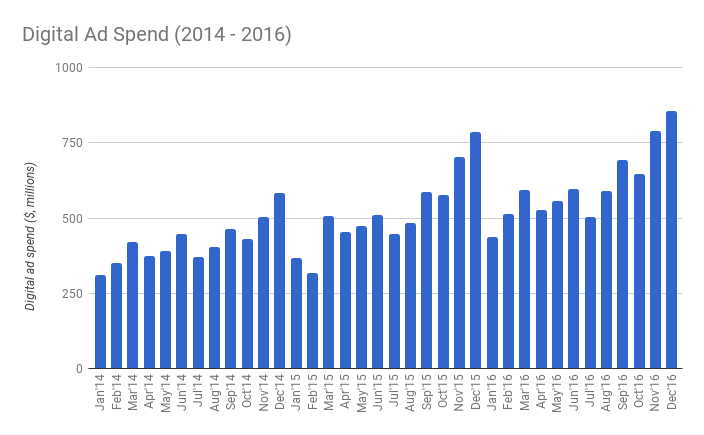 Figure 1: Monthly digital ad spend from January 2014 - December 2016 as reported by the Standard Media Index at https://www.standardmediaindex.com/market-tracker. Last year, for example, Amazon, Wal-Mart, and Macy’s focused even more of their budget on digital holiday spend. In 2016, Amazon increased its holiday digital ad spend by 224% from the preceding year. A significant portion of this increase came from reallocated print ad spend. WalMart significantly increased its digital ad spend during the 2016 holiday season, increasing its total budget by 170% year-over-year. Macy’s increased its digital ad spend by 34% in the 2016 holiday season. Considering the pressure many retailers are currently experiencing, many will likely pursue strategies that boost their online shopping. Unfortunately, digital ad spend isn’t the only thing that increases in Q4. Last year, White Ops observed ad fraud jump during key holiday periods, specifically Black Friday and Cyber Monday. This trend was discovered while monitoring the digital advertising behaviors of 49 ANA member companies between October 2016 and January 2017. These holiday spikes brought the measured fraud rate in Q4 to an estimated 13.5%, almost 2.5x the rate in Q3. Fraud fills the gap when demand outpaces supply. 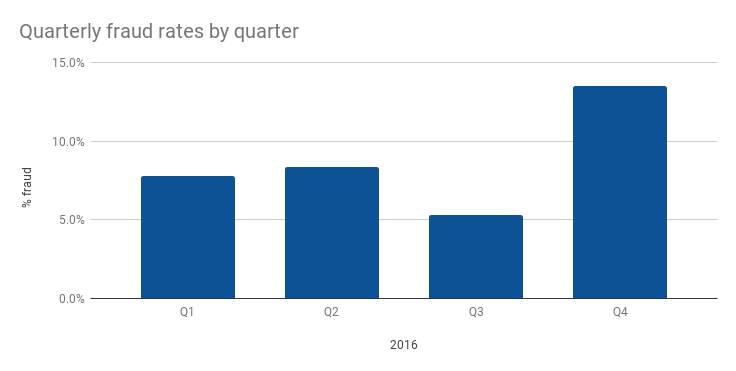 The high rates of fraud in Q4 become particularly concerning when multiplied by the substantial Q4 digital spend. Given the high fraud rates and the high budget, advertisers lost an estimated $3.1 billion during the 2016 holiday season. As cybercriminals leech money from these holiday campaigns, their payout in Q4-17 could surpass $3.5 billion if fraud rates remain the same for the estimated $25 billion in spend. Not only is that a huge blow to the efficacy of growing digital budgets, it also means that these nefarious cybercriminals make most of their revenue in the final quarter of each year. Demand transparency from all vendors. Non-human traffic tends to thrive in areas of opacity. Advertisers should seek out specifics about pricing, traffic sourcing, and the extent of audiences being delivered via owned and operated domains vs. audience extension. Be skeptical of unknown traffic sources. While there are plenty of legitimate third-party sources of traffic — for instance, paid search — traffic sourcing is the most common way in which bot operators make money. Buyers should be vigilant about traffic sources and build language into RFPs and insertion orders that require publishers to identify all third-party traffic sources. Ask about any and all audience extension practices. Audience extension by publishers can introduce high bot percentages by extending content to providers that source traffic. Other investigations by White Ops have uncovered audience extension sites with as much as 97% non-human traffic. Advertisers should ask publishers about any audience extension practices. In any situation where supply does not meet demand for a target audience, non-human traffic will follow. While it may be tempting to create highly-targeted audience segments, avoid too many restrictions on potential supply. Bots are getting more and more sophisticated each day and even the best mitigation strategies have expiration dates. To really protect traffic and improve the efficacy of digital ad spend, advertisers must consider implementing an anti-ad fraud solution. These companies are constantly developing new prevention and detection technology so advertisers can focus on what really matters. The holiday season is a particularly active season for ad fraud and automated threats. As advertisers increase their digital spend in Q4, they should take the necessary precautions to ensure they are protected from cybercriminals and ad fraud attacks.